Workers in the hotel, restaurant and catering sector have gained a pay rise consistent with inflation rate as IUF-affiliated UTHGRA signed an agreement last July with the employers association in Argentina. After a 15 year fight by meat unions, the Brazilian Government set up a tripartite commission to investigate the appalling lack of health and safety in Brazil’s meat industry. This process resulted in the passing of comprehensive regulations which have the potential to benefit 1 million workers. The IUF-affiliated Fiji Sugar and General Workers Union (FSGWU) has just completed a strike ballot of its membership in the Fiji Sugar Corporation (FSC). Seven years of the FSC’s refusal to bargain, of violating labour laws and of breaking collective bargaining agreements left the union with no option. As part of their campaign, better jobs 4 better chicken, Australia’s National Union Of Workers (NUW) recently surveyed 1000 workers in the poultry industry concerning safety. 62% of poultry workers received less than two hours of manual handling training with 37% saying they have had no such training at all. The US Department of Agriculture has proposed modifications to its poultry slaughter inspection program which would remove the requirement of processors to test for salmonella or campylobacter and permit line speeds of 175 birds per minute. Since March this year, workers employed by Mondelez around the world have campaigned for the company to respect human rights and meet with the IUF. When the Cadbury Adams union members employed by Mondelez in Lebanon were abruptly told their chewing gum factory was to close and the jobs were being moved to Egypt where labour costs were lower and the company had smashed the union, they were shocked at the Company deceit. If running is a pleasure, running for good causes is a real pleasure. 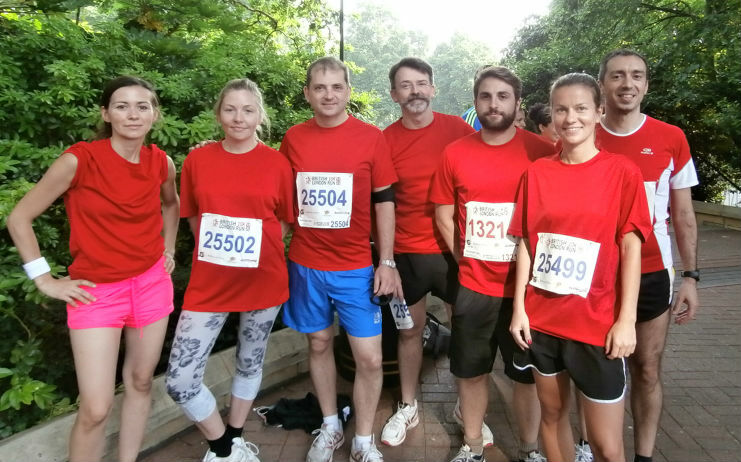 This is what IUF's Massimo Frattini did last Sunday, 14th July, in London in The British 10K London Run.